If you need to secure an area inside your warehouse, Anello Fence can assist you. We have erected many fences inside of warehouses for uses such as inventory control, tool cribs, and area dividers. We pride ourselves on using the very best available materials and expert installation. We can accommodate your indoor fencing needs. 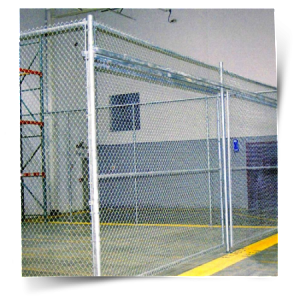 We can also meet your needs for interior cages, dividing fences for warehouses and any and all types of temporary fences. Call us today for indoor warehouse fencing information.